The Magic Drum Orchestra is a 20+ piece percussion group led by Glyn “Bigga” Bush and Ralph Cree. 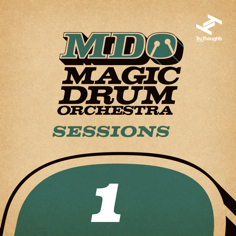 After nearly 10 years and 100 different drummers the band have recently signed to Brighton-based label Tru Thoughts, on which their first EP “MDO Sessions 1” is released on 10 March. The EP features their ultra-heavy version of Benga’s dubstep anthem “Crunked Up” along with live showstopper “Drop It Like A Funky Muppet” (based on Snoop Dogg and Pharrell Williams’ hip hop classic) along with stunning original material.